1Department of Forest and Natural Resources Management, One Forestry Drive, SUNY: College of Environmental Science and Forestry, Syracuse, NY 13210, USA. 2USDA Forest Service, One Forestry Drive, SUNY: College of Environmental Science and Forestry, Syracuse, NY 13210, USA. Since 1989, Dry Lake, a unique basin located in the New York state park Clark Reservation, has experienced periodic flooding of silt-laden water from the adjacent Doubletree residential housing development. This study examines the effect of urban runoff on the native woody vegetation of the flooded zone. We selected two species of trees from both the inundated and non-flooded zones for growth studies: bitternut hickory (Carya cordiformis) and sugar maple (Acer saccharum), cored sample trees at breast height (1.37 meters) on the north and south faces, and measured the ring widths of the cores to the nearest 0.001 millimeter. Our statistical comparison of tree ring-width indices measured before and after Doubletree construction commenced showed that bitternut hickory growth has not been affected by flooding (P = 0.701). In contrast, sugar maple trees sampled from the flooded zone exhibited increased ring-width indices in the 12 years after Doubletree development began (P = 0.06). We found that a third species on the site, eastern hemlock (Tsuga canadensis), is intolerant of flooding, and all trees of this species in the flooded zone died. Figure 1: Recent Google Earth view of Dry Lake and Glacier Lake, their watershed areas (dotted light blue), the nearly completed Doubletree residential development (solid red border), and the proposed development Hummel Estates (dotted red border). The detention basin for Doubletree and the intermittent outflow stream that connects to Dry Lake are shown in medium blue. Urbanization is considered one of the main causes of land-use and land-cover changes. As a consequence, urbanization has affected the structure, dynamics, and functions in a variety of ecological systems (Luck and Wu 2002). Urbanization also has significant hydrological impacts, including effects on the processes and rates of erosion and runoff (Goudie 2000; Weng 2001). The construction stage of the urbanization process is responsible for the highest erosion rates. During the construction stage, the removal of trees and vegetation leaves soil exposed, causing high rates of erosion. In addition, this stage has high levels of site disturbance (Goudie 2000). Construction sites can reach erosion rates of up to 163 metric tons per hectare per year (Krenitsky et al. 1998). Clark Reservation State Park in central New York State contains glacier and karst topographic features and the vegetation they support at the lower end of a 146-hectare watershed. Nearly 101 hectares, or 66% of this watershed, is located outside the Park boundaries (Lendrum 1996). One of the Park's features is 4-hectare, meromictic Glacier Lake, which was formed as a plunge basin by runoff from continental glaciations (Van Diver 1980). Adjacent to Glacier Lake is a smaller closed basin known as Dry Lake, which in dry periods drains through the bottom of the basin (Figure 1). Figure 2: An aerial photo looking approximately southeast of Glacier Lake and Dry Lake in the mid-1930s (Sydansk 1936). Hemlock trees identifiable on this photo were found to have died, apparently owing to high water levels during the 1990s. The Dry Lake basin is marked "B." Note the agricultural use on the watershed, part of which extends off the picture to the right. Before the construction of Doubletree began, the Dry Lake basin usually held standing water for only short periods of time. There is evidence that water levels did not exceed approximately 3.66 meters in depth above the floor of the basin (Figure 2). However, after construction of Doubletree began, the basin was affected by siltation and excess water. As a consequence, water levels have reached as high as 8.5 meters above the floor of the basin (Figures 3 and 4). 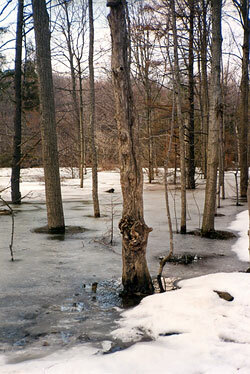 Many trees in the flooded zone have been affected by thick layers of ice that accumulate in the floodwater and damage the trees' bark, often down to the cambial layer (Figures 5 and 6). The flooding is caused primarily by siltation, which fills crevices in the ordinarily permeable surfaces of Dry Lake basin and the upstream watershed. This results in a greater volume of water flowing into the basin and remaining. The depth of silt and larger soil particles varies across the floor of the basin, with greater amounts near the inflow stream. Near the center of the basin, the rate of sedimentation over the first 13 years post-development of Doubletree has averaged 4.8 centimeters per year (Franco 2002). The surfaces of flood water freeze in the winter, forming thick layers of ice that damage the bark of flood-zone trees down to the cambial layer and result in death (Figures 5 and 6). Siltation and flooding have also affected herbaceous vegetation in the open part of the bowl, altering the community composition of the basin (Figure 7). Figure 3: Flooding effects at Dry Lake basin; photo taken from the non-flooded area (April 8, 2001). The main source of inflow water is the small stream, Dry Lake Stream, on the left. It originates in the Doubletree detention basin. The recently proposed Hummel Estates Residential Subdivision would cover approximately 20% of the watershed of Glacier Lake (Figure 1) and presents a major concern for environmental impacts caused by future development. The Glacier Lake area consists of old field recovery from agriculture. A two-lane state highway runs from east to west between the Doubletree and proposed Hummel Estates development areas and the park, but culverts beneath the highway allow water into the park. A major unknown regarding flow from the proposed Hummel Estates into Clark Reservation is the ultimate destination of the water after it sinks into Dry Lake's floor of fractured bedrock and on a limestone shelf above Glacier Lake (Heisler 1996). Because of concerns about damage in the park, developers and the town planning board modified plans for Hummel Estates reducing the number of planned dwellings from over 80 to 32, placing most of the northern half of the property into a permanent no-disturbance parcel, and directing south much of the storm water from the developed portion into a through-flowing stream. Figure 4: Flooding effects at Dry Lake basin. 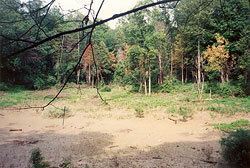 Photo taken from the non-flooded area (April 8, 2001). The hemlock trees in the foreground and on the right have been killed by high water. The purpose of our study was to analyze the impact of the Doubletree housing development on the vegetation of the Dry Lake ecosystem at Clark Reservation State Park in order to better inform future development decisions affecting the watershed area for Glacier Lake. The main objective of this study was to determine how sugar maple (Acer saccharum) and bitternut hickory (Carya cordiformis) in the Dry Lake ecosystem of Clark Reservation State Park respond to flooding by observing changes in annual growth rings of stem xylem from individual trees. We compared ring-width growth of specimens of both species from the flooded zone to those in the non-flooded zone before and after the construction of Doubletree. Our study updates and expands upon the research of Drew and Wink (1997; 1999) on impact to vegetation. Figure 5: Some species including sugar maple in the flooded zone of Dry Lake were heavily damaged by ice, although they continued to live. Here we see severe damage by ice on a sugar maple tree in the zone that is flooded at high water, January 1, 1997. Clark Reservation State Park is located in Onondaga County, 3.11 kilometers southeast of the city of Syracuse, New York, and 0.78 kilometers west of the village of Jamesville. It is approximately 141.65 hectares in size and its coordinates are 76° 05' longitude and 43° 00' latitude (New York State 2000). The park contains unique limestone-bedrock geology that includes the 4-hectare, 18-meter deep, meromictic Glacier Lake created in a plunge basin 55 meters below the lip of a melt-water falls that existed in the last continental glaciation (Van Diver 1980). Other, smaller closed basins in the Park were created either by limestone solution or as plunge basins during periods of less flow or shorter duration than those of Glacier Lake. Dry Lake is a roughly circular depression about 2 hectares in size and approximately 12 meters deep. 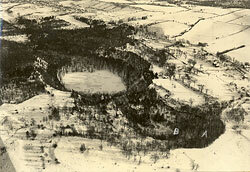 It is believed to be a karst feature created by dissolving limestone that formed a sinkhole basin. The bedrock is 300–400 million years old (Van Diver 1985) and its fissures allowed for rapid post-glacial water drainage. Sydansk's 1936 thesis briefly describes the pre-Doubletree vegetation and ecological processes within the center of the Dry Lake basin. Sydansk describes the area as "a rather small inconspicuous bowl supporting dense herbaceous vegetation but quite free of woody plants. In the winter…when the soil freezes, drainage is reduced materially and the area" fills with water "forming a small lake, the surface of which freezes over." "The water beneath the ice slowly drains out…. The ice…sags and pulls toward the center of the bowl…breaking all vegetation encased in it." Sydansk also states that forest growth began at about 3.66 meters, allowing us to estimate the pre-Doubletree water level at about 3.66 meters above the floor of the basin. The forest community along the edge of Dry Lake basin was composed of Allegheny hardwoods (oak, hickory, tulip poplar), which predominated in early successional stages and later gave way to the northern hardwoods (sugar maple, American beech, yellow birch, Eastern hemlock, white pine) which comprised most of the area's supporting climax vegetation (Sydansk 1936). The vegetation today is very similar to the vegetation described by Sydansk. Figure 6: Dry Lake in late winter 1995 at high water, 7.9 meters (26 feet) above the floor of the basin, and with ice cover. Brown needles of a hemlock tree recently killed by the flooding are visible near the center of the photo. At around 1940, the flora of Clark Reservation included 304 species of ferns and flowering plants (Egler 1943). The American hart's-tongue fern (Phyllitis scolopendrium (L) Newmn. var americana Fern.) was first sighted in North America in 1807 a few miles west of Clark Reservation (Cinquemani et al. 1986). In the United States, the American hart's-tongue fern is federally listed as threatened, and Clark Reservation State Park was founded in 1926 primarily to provide protection for the plant. About 70% of the U.S. population of hart's-tongue fern lives in Clark Reservation (Cinquemani-Kuehn and Leopold 1992). Clark Reservation provides recreation for thousands of visitors each year. Since 1995, the New York State Open Space Plan has included Clark Reservation State Park as a high priority area for protection from outside influences. The plan states, "conservation measures are needed in areas outside and upstream from the park in order to protect these cultural environmental resources" (New York State Department of Environmental Conservation and the Office of Parks, Recreation and Historic Preservation 2006). Figure 7: By midsummer, the Dry Lake basin is typically dry. The recent silt left by runoff, primarily from the Doubletree development, is visible. Trees with brown foliage were killed by high water or by bark damage caused by ice. Drew and Wink (1997 and 1999, respectively) cored 12 sugar maple and 14 eastern hemlock trees, equally sampling the seasonally inundated and non-flooding zones. Trees were cored on the east face with an increment borer at breast height and cores were air-dried, mounted on strips of wood, and surfaced. Ring widths were measured to the nearest 0.001 millimeter and the cores cross-dated to determine the year of each tree's death. On November 29 and December 9, 2001, we collected increment corings from one additional tree species and updated cores collected previously from sugar maple. These were chosen from the east side of Dry Lake. 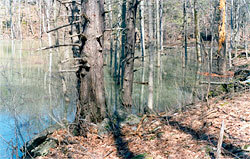 Twelve sugar maple trees were chosen, six from the seasonally inundated zone below the 7.9 meter high water line, which were the same individuals cored by Drew and Wink (1997), and six trees arbitrarily selected out of twelve trees from outside the flooded zone, up the slope above the known high water level. We measured only the undamaged circumference of sugar maple growth rings. We randomly selected twelve bitternut hickory trees, six out of the nine individuals in the flooded zone and six out of the ten in the non-flooded zone. All trees were of dominant or co-dominant crown classes. We cored trees at breast height on the north and south faces, with care taken not to core directly above or below points of bark damage where a wound response effect could alter growth and bias diameter increment estimates (Drew and Wink 1997). We then measured the ring widths of the cores to the nearest 0.001 millimeter and also recorded the trees' diameter at breast height (BH = 1.37 meters). We used WinDENDRO, an image analysis system specifically designed for tree-ring measurement and analysis, to measure individual annual ring widths. For greater precision, the analysis was revised by browsing the image for missing or false rings. The extraction of two cores per tree over six trees allowed for analysis of variation within and among trees on a site. Ring widths were averaged for each tree and converted to a ring width index for each year (Fritts 1976). Ring-width indices were derived and calculated as a ratio of actual ring widths and divided by the estimated ring width from the overall growth curve. One bitternut hickory was excluded from analysis because the growth rings were not prominent enough to measure. Paired t-tests with a 90% confidence level (0.1 alpha level), due to the small sample size, were used to make the following comparisons: average difference in ring-width indices from the two tree species between flooded and non-flooded zone, and comparison and average comparison before and after the construction of Doubletree (before 1989 vs. 1990–2002). 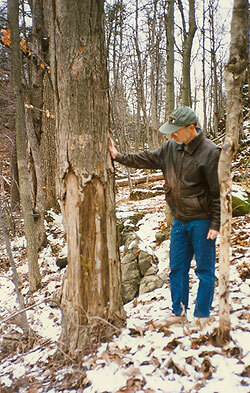 The previous work of Drew and Wink (1999) showed that six out of seven of the dead eastern hemlock trees from the inundated zone had died in the 1990s (Figure 4), post-Doubletree. The trees from the non-flooded zone appeared healthy, without any indication of abnormal or reduced growth. These findings are consistent with the ecology and habitat of the species. According to White (1973) and Whitlow and Harris (1979), eastern hemlock is considered intolerant of short-term flooding during the growing season. Growth rate index of bitternut hickory increased from 0.997 ± 0.004 to 1.165 ± 0.197 in the flooded zone and from 1.002 ± 0.004 to 1.119 ± 0.233 in the non-flooded zone, although the difference was not significant (P = 0.701). Our results show that the construction of Doubletree has not yet affected the bitternut hickory trees in the flooded area of the basin; these results appear to be inconsistent with the ecology and habitat of this tree species. Whitlow and Harris (1979) and Loucks (1987) consider bitternut hickory an intolerant species—one that would suffer considerable injury if its soils were saturated for more than 30 days during the growing season. In the case of sugar maple, growth rate index increased from 0.990 ± 0.004 to 1.275 ± 0.388 in the flooded zone, and growth rate index decreased from 1.001 ± 0.008 to 0.883 ± 0.212 in the non-flooded zone. The growth index of the trees in the flooded zone is significantly different from that of the trees in the non-flooded zone (P = 0.06). The increase in average ring width of the sugar maple trees in the flooded zone may be due the presence of fertilizers in the run-off water from Doubletree, acclimation of the sugar maple to the new wetter environment, or other unknown factors that may promote increased tree growth. Many sugar maples in the flooded zone have suffered ice damage to their cambia, and ring widths may have increased as a result of concentrated growth in the undamaged sections of the boles. Just as with bitternut hickory, the results obtained for sugar maple seem to be inconsistent with the ecology of this tree species. According to White (1973), sugar maple trees are intolerant of flooding and will not stand flooding for more than 10 days. Hall et al. (1946), Broadfoot and Williston (1973), and Whitlow and Harris (1979) also consider sugar maple a flood-intolerant species—defined as one that won't survive continuous flooding (of at least 0.3 meters deep of standing water) during significant portions of its growing season. The construction of the Doubletree residential project on the watershed of Clark Reservation State Park has had a variety of effects on the park's ecosystem; thus far, effects are evident primarily in the Dry Lake basin. Late winter and spring flooding in certain areas caused the death of hemlocks present there. Hemlocks did not appear to suffer from ice damage, but trees of other species were killed in the flooded zone, with ice damage appearing to be a primary cause of mortality. Bitternut hickory and sugar maple were the two tree species chosen for growth studies. Only sugar maple responded positively to flooding by exhibiting an increase in lower-stem ring growth. These findings support the results of Drew and Wink (1997), who reported an increase in ring widths of the sugar maple trees cored in a seasonally flooded zone. Bitternut hickory has yet to show any significant negative flooding effects on diameter growth rate, and bark damage was minimal. Differing degrees of flood intolerance were exhibited by the three species tested. Our results show that eastern hemlock is the most flood-intolerant of the three. Hemlock trees in the flooded zone died shortly after construction began on Doubletree. Bitternut hickory appeared unaffected by the flooding. Sugar maple exhibited an increase in ring widths, an effect in direct opposite to our hypothesis. However, ice damage to bark of sugar maples has been severe. Therefore, we recommend continued monitoring of ring growth on bitternut hickory and sugar maple. The post-development watershed impacts on the park ecosystem exceeded the effects of agricultural activities on the watershed, which date back more that 100 years. 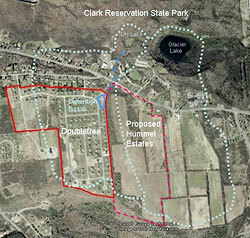 Thus, further development within the watershed, even if external to Clark Reservation State Park, will likely increase the impacts on the park's ecosystem. Eastern hemlocks have already died, and continued flooding has potential to negatively affect other species in the Dry Lake community, in addition to those addressed in this study. Broadfoot, W.M., and H.L. Williston. 1973. 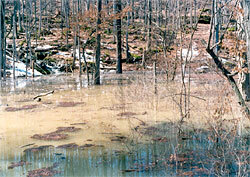 Flooding effects on southern forests. Journal of Forestry 71(9): 584–587. Cinquemani, D.M., M.E. Faust, and D.J. Leopold. 1986. Period censuses (1916–1986) of Phyllitis scolopendrium var. americana in Central New York State. American Fern Journal 78(2): 37–43. Cinquemani-Kuehn, D.M., and D.J. Leopold. 1992. Long-term demography of Phyllitis scolopendrium (L). Newm. var. americana Fern. in central New York. Bulletin of the Torrey Botanical Club 119 (1): 65–76. Drew, A.P., and R.A. Wink. 1997. Sugar maple growth effects related to rising water levels in Dry Lake, Clark Reservation State Park. Report submitted to New York State Office of Parks, Recreation and Historic Preservation, Clark Reservation State Park, Jamesville, NY. Drew, A.P., and R.A. Wink. 1999. Eastern hemlock mortality related to rising levels in Dry Lake at Clark Reservation State Park. Report submitted to New York State Office of Parks, Recreation and Historic Preservation, Clark Reservation State Park, Jamesville, NY. Egler, F.E. 1943. The ferns and flowering plants of the Clark Reservation, Onondaga County, New York. New York State College of Forestry Technical Publication No. 61, College of Forestry, Syracuse, New York. Franco, C. 2002. Impact of housing development on the Dry Lake ecosystem of Clark Reservation State Park, New York. Syracuse, NY: State University of New York. Fritts, H.C. 1976. Tree rings and climate. London: Academic Press. Goudie, A. 2000. The human impact on the natural environment. Ed. 5. Cambridge, Massachusetts: The MIT Press. Hall, T.F., W.T. Penfound, and A.D. Hess. 1946. Water level relationships of plants in the Tennessee Valley with particular reference to malaria control. Journal of the Tennessee Academy of Science 21(1): 18–59. Heisler, G. 1996. Need for open space and resource protection at Clark Reservation State Park. Report to Region 7 Regional Advisory Committee. Krenitsky, E.C., M.J. Carrol, R.L. Hill, and J.M. Krouse. 1998. Runoff and sediment losses from natural and man-made erosion control materials. Crop Science 38: 1042–1046. Lendrum, C. 1996. Poorly planned developments can alter park ecology. New York Environment 20(6): 9. Loucks, W.L. 1987. Flood-tolerant trees. Journal of Forestry 85(3): 36–40. Luck, M., and J. Wu. 2002. A gradient analysis of urban landscape pattern: a case study from the Phoenix metropolitan region, Arizona, USA. Landscape Ecology 17(4): 327–339. New York State. 2000. Clark Reservation State Park brochure. Office of Parks, Recreation and Historic Preservation, Jamesville, NY. New York State Department of Environmental Conservation and Office of Parks, Recreation and Historic Reservation. 2006. New York State 2006 Open Space Conservation Plan, Chapter 9: Generic Environmental Impact Statement. New York State Department of Environmental Conservation. Available from: http://www.dec.ny.gov/lands/26433.html. Sydansk, R. 1936. Some phases of the forest ecology of the Clark Reservation State Park. New York State College of Forestry, Syracuse, NY. Van Diver, B.B. 1985. Roadside geology of New York. Missoula, Montana: Mountain Press Publishing Company. Van Diver, B.B. 1980. Upstate New York. K/H Geology Field Guide Series. Dubuque, Iowa: Kendall/Hunt Publishing Company. Weng, Q. 2001. Modeling urban growth effects on surface runoff with the integration of remote sensing and GIS. Environmental Management 28(6): 737–748. White, R.M. 1973. Plant tolerance for standing water: an assessment. Cornell Plantations 28: 50–52. Whitlow, T.H., and R.W. Harris. 1979. Flood tolerance in plants: a state-of-the-art review. National Technical Informational Service, U.S. Department of Commerce. Table 1: Average of growth indices for individual bitternut hickory trees in the flooded and non-flooded zones of Dry Lake before (GIpre) and after (GIpost) the start of Doubletree housing development in 1989, and average difference in the observed growth indices (DIFF in GI). Table 2: A matched pair of t-tests for bitternut hickory using a risk level of 0.1. Table 3: Average of growth indices for individual sugar maple trees in the flooded and non-flooded zones of Dry Lake before (GIpre) and after (GIpost) the start of Doubletree housing development in 1989, and average difference in the observed growth indices (DIFF in GI). Table 4: A matched pair of t-tests for sugar maple using a risk level of 0.1.